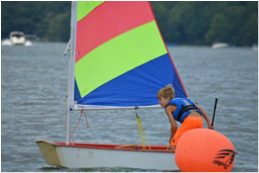 ﻿One week, full-day lessons from 9:30 a.m. to 4:00 p.m. are offered to sailors ages 8-18 throughout the summer. Sailors receive both on-the-water and off-the-water instruction primarily in Optimist Prams, RS Teras and Lasers, and may also be instructed on Flying Scots as conditions allow. Sailors are taught as a group, or two groups, but each sailor also receives some individualized coaching to help him or her progress through a sequence of levels (certificates accompanied by pins) at his or her own pace. Each junior week will be held at DCSS's facility located at Deep Creek Yacht Club at Turkey Neck. All sailors must wear life jackets at all times on or near the water. The week begins with a mandatory swim test followed by an in-the-water capsize drill. 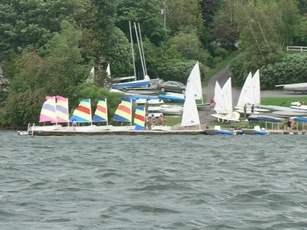 Sailors then receive basic sailing and safety instruction, on-the-land and boat rigging instruction. Regardless of experience, and weather permitting, each sailor will sail on the first day. Each of the following days includes a chalk talk and on-the-water instruction. Usually the week includes a long-distance sail to Deep Creek Yacht Club at Deerhaven and back, and each week concludes with an awards ceremony. DCSS reserves the right to dismiss a student from sailing school with a pro-rated refund. One week each summer is dedicated to helping students age 13 and older improve their sailing and racing skills on RS Teras, Lasers and Flying Scots. DCSS’s curriculum allows sailors to progress through a series of levels at his or her own pace. Each level includes a list of criteria and is accompanied by a certificate and pin. The levels for Optimist Prams and Lasers include yellow (beginner), green (intermediate), red (intermediate-advanced), blue (advanced), silver (racing) and gold (advanced racing). Sailors begin learning basic boat rigging and de-rigging, identification of parts, safety, knot tying and basic boat handling, then move to more advanced drills and racing rules. Seamanship, sportsmanship and willingness to try are highly valued and encouraged. All sailors must pass a swim test that includes swimming 50 yards alongside of the dock and staying afloat, in place, for up to a few minutes. DCSS has a fleet of Optimist Prams, RS Teras and Lasers. The Lasers have full, radial and 4.7 rig options. New and smaller (under 90 lb) sailors usually sail Optimists or Teras. Heavier, older, or more experienced sailors usually sail Teras or Lasers with the appropriate size rig and sail. Wind conditions may also dictate which boat is most appropriate for each sailor, and the type of boat may vary during a given week. 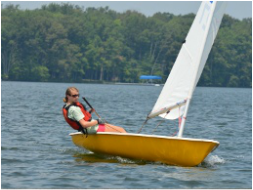 Sailors are welcome and encouraged to bring their own Optimist, Tera or Laser, and parents receive a discount of $50 per week for providing their own boat.